JERUSALEM, June 3, 2013 – Women for the Wall, a grassroots organization committed to preserving the sanctity of the Kotel strongly condemns the threat of violence against the Chief Rabbis of Israel and the charedi community at large. 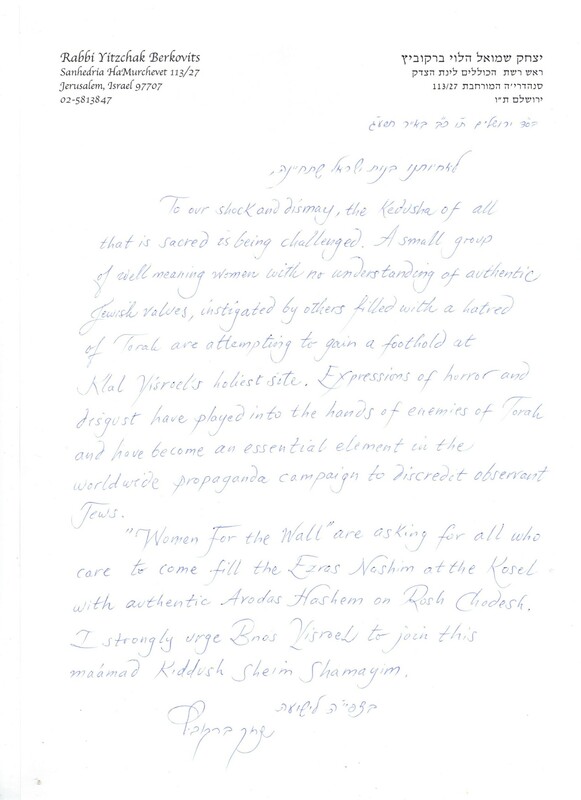 Today a letter addressed to the Chief Rabbis threatened them if they continued to oppose the efforts of the Women of the Wall, led by Reform activist Anat Hoffman to pray at the Kotel in a fashion not following classical Jewish tradition. Ronit Peskin, Women for the Wall founder stated “we are deeply troubled that threats of violence are being used. We call on the leadership of Women of the Wall and the liberal Jewish organizations backing them to repudiate this dangerous escalation of conflict over the Western Wall. “We are extremely pained by the atmosphere of divisiveness and hate that has developed as a result of Women of the Wall ‘s insistence to introduce unilateral changes to the prayer tradition practiced at the Western Wall,” said Ronit Peskin. “We call on Women of the Wall to join us in dialogue that can hopefully defuse the situation and lead to sufficient trust for reaching a mutually acceptable solution. Isn’t it ironic? Don’t you think? WOW is always condemning Charedim for violence.Look who is talking. Ironic that some nutcase would think that such a threat would help WoW’s cause. People disgusted by the thuggish behavior of Chareidim at the Wall this last Rosh Chodesh are actually victims of a 24 year long plot prepared by the self-titled Women of the Wall. For 24 years they have been waving a red flag in front of the Jewish bull. Women of the Wall is a group of women led mainly – but not only – by members of the Reform Movement. The Reform Movement has four core beliefs. •	They believe that the Torah is a composite document authored by many writers over a period of many years. Their belief is based on the work of the Bible critics even though their theory was disproved over 100 years ago. •	They believe that as long as one acknowledges the ethical basis of mitzvot, there is no obligation to actually do them. •	They believe that a person has the choice to do whatever he feels is right and appropriate for himself. •	They believe that much of the Torah, Halacha and Customs is neither relevant nor suitable for the modern world. Therefore they rejected concepts such as sacrifices, a third Temple, marriage and divorce as set out in the Torah, the special status of Israel, the Messiah as an individual, Judaism’s definition of the special role of women, and much more..
As you can see, the Reform Movement has only a superficial similarity to Judaism and cannot be regarded to as a valid branch of Judaism. Nowadays, it is doubtful if many members of the Reform are actually Jewish. As far back as 80 years ago, membership of the Reform Movement was not a guarantee of being Jewish. And that was before the Reform Movement began to encourage mixed-marriages and decided to regard children of only a Jewish father as being Jewish. Halakha defines the mother as the parent who passes the status of belonging to the Jewish people on to her children. However, their movement has no attraction for Christians or Muslims or the uncommitted and the only way they can swell their membership is to appeal to Jews as if they are a valid form of Judaism. So they play the double-faced game. Outwardly, they present themselves as if they are a branch of Judaism, even though their basic creed is almost bereft of any similarity to Judaism. So, if you do a search for the Reform Movement, you will see that their sites present themselves as if the follow all the Jewish mitzvos. For example, you will see that some sites present Shavuot as being the festival of the Giving of the Torah at Mount Sinai – which clearly contradicts one of their core beliefs – but that does not worry them because their main purpose is to trick people into thinking they are a branch of the Jewish Religion. The Nazarene extolled his followers, “Be all things to all men” and they follow his advice. Most, if not all of the leaders and Staff of WoW are Reform, Conservative and/or Feminist. According to Reform ideology, the Wall has no sanctity; there is no obligation to wear a tallit or tefillin or to cover the head, nor to read from the Torah, most of which is irrelevant to them. Overtly, Anat Hoffman presents as a sincere person who, with others, wants to assert her right to pray at the Wall the way she feels is appropriate. ‘WoW’ asserts that they are fighting for the right of women to pray at the Wall – even though hundreds, thousand of women pray there regularly. They assert that they are fighting for pluralism – tolerance for diverse groups to pray freely at the Wall – even though it is a common sight to see all sorts of people from all sorts of religions praying freely at the Wall. As such, her group has aroused much sympathy from the media and from groups in Western countries. The antagonism from the local rabbinate is interpreted as being undemocratic and as stifling the valid feelings of the women and preventing them from being able to serve Hashem in the way they wish. Their supporters quote various authorities who do permit women to wear tallit and tefillin, even though the assumption is that this can be permitted only in private. But their leaders are playing a double-faced game. Three of them have admitted in public that they are using ‘WoW’ as a tactic to demonize and undermine the authority of Orthodox Judaism. In an interview with the BBC, Anat Hoffman, leader of the Women of the Wall, revealed her true identity and purpose, which is to undermine the authority of the halakhah- and gain recognition for Reform ‘Rabbis’, conversions, weddings and divorces. So now we can analyze her tactics more accurately. She chooses the Wall because it is an emotional backdrop and a perfect setting for her activities. 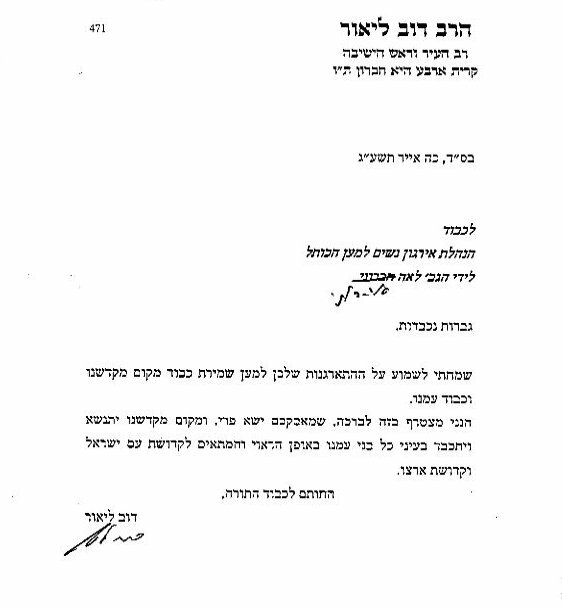 The Official 1999 statement of the Progressive Rabbis in Israel’s attitude to the Wall is “One should not consider the Western Wall as possessing any sanctity. . . The approach of the Progressive Jew towards worship and prayer is opposed to any renewal of the Temple, opposed to the restoration of sacrificial worship. . . . The Western Wall does not represent Jewish cleaving to HaShem nor the experience of prayer nor Jewish thought for our times.” They have the same attitude to wearing tallit and tefillin. In reality, the feelings of ‘spiritual’ elation the women have when they engage in these practices are purely psychological. Firstly because throughout the ages, apart form extremely rare exceptions, women have never sought spiritual enhancement through wearing tallis and tefillin, and never through making their own minyanim and reading from the Torah. This means that these are not the ways that G-d wants women to use if they want to come closer to Him. Secondly, many of the women are not wearing their tallit and tefillin correctly. Thirdly, many of the women are not covering their hair correctly and/or dressing according to the code of modesty and it is then forbidden for them and others to wear tefillin. Furthermore, it is not they way of a modest Jewish woman to pray and sing loudly and, in a situation when men can hear her, it is forbidden. Is she remaining faithful to Moshe and the Torah he passed on to us from G-d? Is she continuing the tradition of those brave women in her daily life? Of course, she is not. In fact, she is denigrating the Torah and fighting a war against its authority and sanctity. So why is she choosing that day? Because she is using it to ensnare women to follow her. She looks forward to reading the Megillah because the heroine is a woman – Esther – even though Esther was totally and traditionally observant and submitted to the authority of a male rabbi – Mordecai. But that does not worry Anat because the idea appeals to women, so she includes it in her double-faced scheme. This past Rosh Chodesh, the Women of the Wall came late, and, instead of praying at the outside of the gathering, they violently pushed their way into the devoutly praying women, and proceeded to pray in loud voices, disturbing all those around. Their prayer session clearly shows elements of deliberate provocation and rabble-rousing, totally unfitting the holy Wall and contradicting their claim that they only want to pray in peace. When leaving the Wall, pious, sincere, modest Jewish women would have left in a subdued state, deeply saddened by the ensuing rioting. However, if you look at a video http://www.youtube.com/watch?v=l7Yj3FKwCPw showing how they left, you will see they left, singing and dancing, desecrating the sanctity of the Wall, offending the feelings of those who had come to pray. Their faces were glowing with victory, because at last, after 24 years of inciting, they had been successful in causing a riot which they knew would be posted all over the world showing how the Chareidim are behaving badly. Surely, this is more “thuggish” than what the “Chareidim” did to them. Merriam-Webster explains that ‘Thug’ was the name given by the British in India in the 19th century to a member of a band of thieves and murderers. A thug would pretend to be friendly with a traveler and offer to share a journey. Then as soon as it was safe to do so, the thug would strangle and rob his companion. The word thug comes from thag, a Hindi word coming from sthagati, a word in Sanskrit meaning “he covers up, he hides”. The term fits the ‘WoW’ leaders better than their attackers. Furthermore, if praying at the Wall is so dear to them, where are they during the other days of the month? And anyway, to change an arrangement which satisfies many hundreds, thousands of people, just to accommodate the demands of less than a hundred unreasonable women who come just for an hour a month is clearly undemocratic. Why unreasonable? Because they have received many offers which would defuse the situation and they reject all of them. Why do they reject them? Because they want to achieve maximum provocation. As Anat herself said last December when she rejected the offer to pray in the Robinson’s Arch, “I want to see and be seen.” These are not the words of a modest, sincere Jewish woman whose only desire is to talk to G-d as she sees fit. So, my friends, if you feel sympathy for the Women of the Wall and feel disgusted by the behavior of the “Chareidim”, you have fallen into their trap.